Local religious groups have organized an interfaith peace vigil tonight and all are welcome. "From time to time, circumstances like this come up and that’s when we come together," according to one organizer. 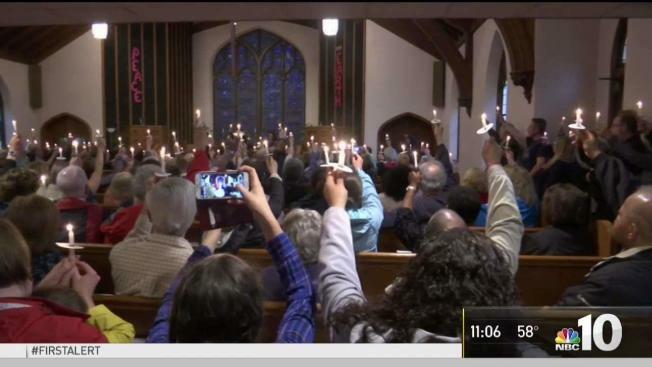 Members of the faith community gathered for a candlelight vigil in Montgomery County Thursday evening to oppose recent KKK activity. NBC10s Drew Smith reports. A candlelight vigil is taking place Thursday in Ambler in reaction to racist and anti-Semitic fliers and graffiti bubbling up. The Wissahickon Faith Community Association, made up of various religious clergy, members of the public and elected officials in Montgomery County, are gathering "to represent our commonality instead of our differences," Rabbi Gregory Marx of Congregation Beth Or in Upper Dublin said. Several unsettling incidents have occurred in and around Upper Dublin recently, including last week in the Maple Glen neighborhood where Ku Klux Klan fliers were distributed to houses. Police did not reveal what specifically was on the fliers, but said they were similar to the KKK recruitment fliers that were distributed in Cinnaminson, New Jersey back on February 12. Graffiti spray-painted in the area of some trails and wooded paths in the area also occurred recently. "As a Jew, I believe when things like this happen, you can't turn away and hope it goes away quietly," Marx said. "You have to stand up. I was raised on that phrase, 'Never again.'" The vigil will be held 7:30 p.m. at Ambler Church of the Brethren, 351 E. Butler Ave. All are welcome.